Elasto-Gel Splint Pads effectively reduce skin maceration. Made of glycerin, water and a polyacromide binder that prevents sticking to wounds. Helps reduce skin maceration and pressure sores. Stays in place with easy-to-apply adhesive backing. 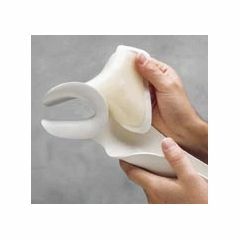 Helps to reduce splint migration and secure the splint without creating shearing forces or bottoming out. Clean with mild soap and air dry. Measures 4in x 4in (10 x 10cm). Sold in a pack of 25. Where exactly do you apply this elasto jel splint?